Stems: Erect, stout, rarely branched, glabrous or sparsely hairy; nodes 2-4; internodes to 8 inches. Leaves: Alternate, simple, linear-lanceolate, 3 to 12 inches long, 1/3 to 2/3 inch wide, glabrous or sparsely soft-hairy at base, parallel veined, rarely folded; margins entire. Inflorescences: Cyme, umbel-like, few- to many-flowered, terminal on main stem; bracts large, leafy, 2 to 12 inches long, glabrous to soft-hairy; folded lengthwise, curving downward, often longer and wider than leaves. Flowers: Stalks densely soft-hairy, sepals 3, elliptic, pointed, 1/3 to 1/2 inch long, soft-hairy, margins sometimes purple; corollas 1 to 1.5 inch wide, blue, purple, or rose; petals 3, stamens 6, filaments densely bearded. Fruits: Capsules, rounded; seeds 2-6, flattened, gray. Habitat: Moist prairies, roadsides, and disturbed sites. Uses: The young stems and leaves can be used raw in salads or cooked as a food seasoning. The Lakota made a jelly-like blue paint from the flowers, which was used for decorative purposes. Comments: Tradescantia is named for John Tradescant, gardener for Charles the First of England in the 17th century. 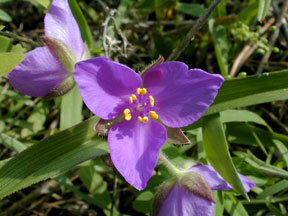 Three other spiderworts are observed in Kansas: common spiderwort , prairie spiderwort , and Tharps' spiderwort .